Don’t you just hate it when it’s time to change your insert (pump insert), you find the perfect site and in goes the insert. Only to find that your perfect site isn’t so perfect after all. It aches with every move you make. It’s impossible to sleep on and it’s just so uncomfortable. This is the situation I found myself in the other night. After changing my insert, as painful as it felt. I decided to ride it out till the morning. Then, silly me with my busy schedule I continued to suffer with this insert until the evening. I finally came to my senses and I thought, “No it has to come out”. 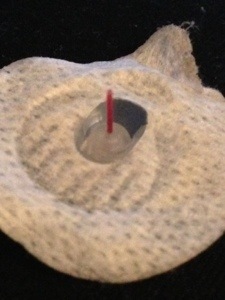 I detached my pump and went to remove my insert only to find, blood pumping out of my arm and from the insert. Could this be the reason for my weird blood sugar readings those past two days. Possibly, probably, now I think about it, most definitely. This mini post is a reminder to me to not put myself in this situation again. The pain, discomfort and not to mention the ample amounts of tissue I used to mop up my arm really wasn’t worth it. Not fun… having that blood coming out while the insulin is trying to go in is more than likely the reason for the BG weirdness. Good luck with the new set! Thank you. The new set worked out a lot better. This is the second time this has happened to me on that site. I guess it’s a site to avoid from now on. Aw. I am so sorry you went through that. That is my one hesitation about pumping and using a CGM. I know stuff like that would happen and I would freak out. My worst inset moment was when I was pregnant with the peanut. I was brave enough to put the insert in my huge belly at the time. It went it fine, it felt fine. Time to change my insert and all I can say is, I’ve never seen so much blood coming from my belly lol scary! I wish I was blogging back then.